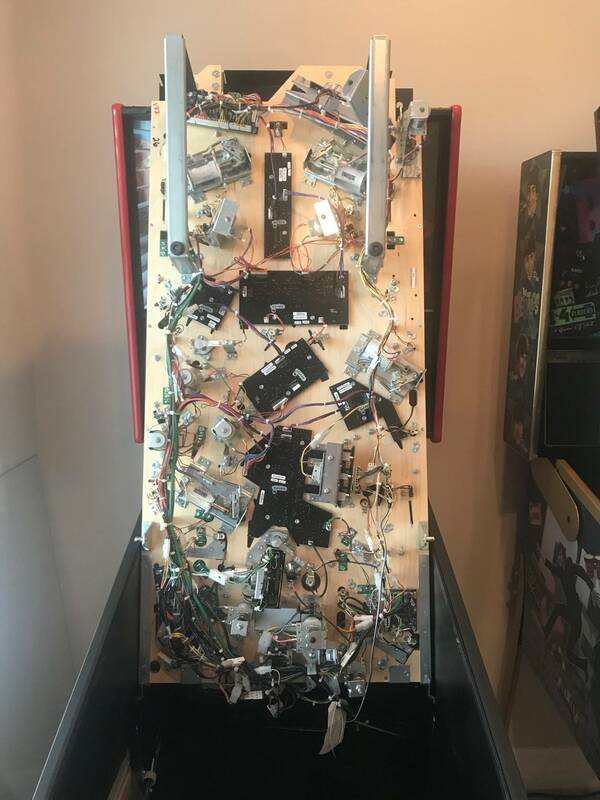 » Forum » Game manufacturers » Stern Pinball » The Beatles Ka-Pow/Stern Pinball (CONFIRMED) pictures and videos..
» The Beatles Ka-Pow/Stern Pinball (CONFIRMED) pictures and videos.. 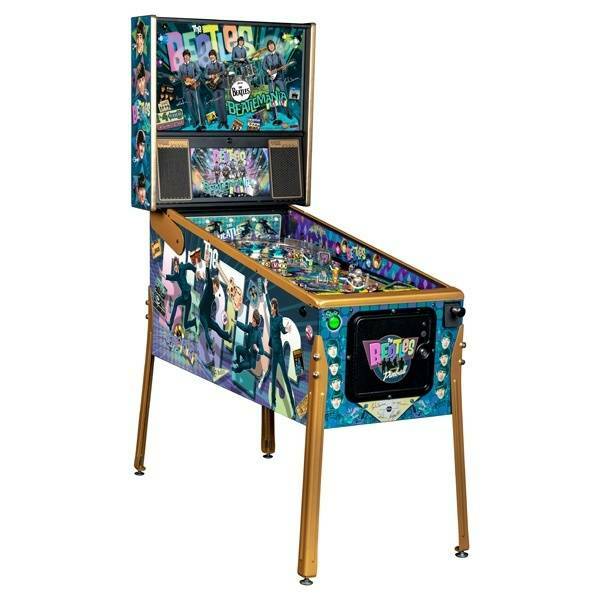 The Beatles Ka-Pow/Stern Pinball (CONFIRMED) pictures and videos.. There have been 410 images uploaded to this topic. (View topic image gallery). There are 3688 posts in this topic. You are on page 74 of 74. IMDN is just clever design. Doesn’t need a bunch of fancy mechs below the pf. And above it is mostly printed plastics. I’m assuming that’s a lot to do with it’s origin as a “homebrew”. Well, to be fair, the homebrew had some fancy stuff under the playfield that the Stern bean counters cut. 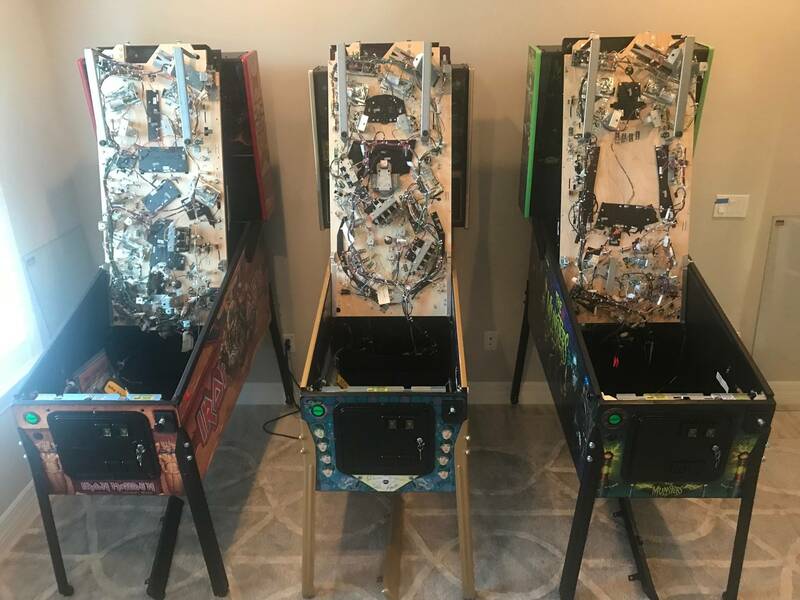 I’ve just been given word of a last minute sale on The Beatles Gold Texas Pinball Festival Demo Games if someone is interested in picking one of these up. Only 2 available at this great price! Contact me via PM or at the store for details. Good news travels. Bad news travels fast. If a pin hits the market and soon after you start seeing them for sale and lousy reviews start popping up, then resale prices take a hit and buyers shy away. Everyone who has played The Beatles has talked about how how it is fast and fun to play. So I don't see anyone selling at distressed prices. I don't see anyone selling at all. And maybe more people are starting to think The Beatles is a "safe" buy that will hold a good resale price. 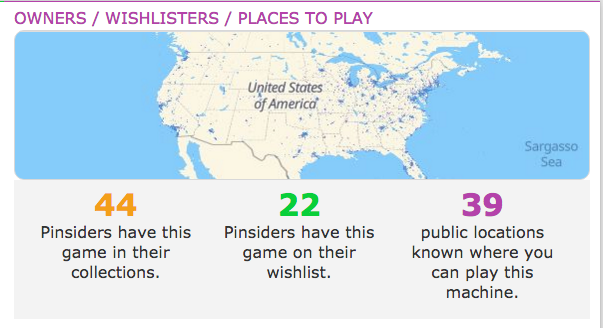 I think I will do my little pinside sales picture weekly and watch how sales do---on pinside anyway. I guess this is an example of everyone has different tastes. I played it for the first time (14 plays) at Pinball Pete's in East Lansing. I don't get it. I thought it was less than "meh". The music clips are spectacular, but the game play was just plain boring to me - hit 3 banks of targets and go around the big loop. No ramps, no novelty, nothing. It seems like a regurgitated SS layout for $9K. I guess I will be one less guy competing to buy one new or used. I literally have no desire to ever play it again. I will say that if you are a Beatles fan, I can see the attraction. Its probably similar to BTTF.... essentially crappy games but the theme is why anyone would own it. You stated your honest opinion. And since you have played it this is more than just wild-eyed speculation. I don't know why you got down voted. So, it is the price that has you all bent out of shape? I picked up a tidbit of speculative info. on another post. This is CPR play fields talking. In the last paragraph, CPR is talking about royalties and license fees as part of the cost of making and selling repro play fields. RE: " In some cases royalties and licensing alone can cost as high as 25% of the full retail value of the PF." Obviously, I have no idea of what Stern had to pay The Beatles for the privilege to make The Beatles pinball machine. Considering the amount of time it took Apple Computer to get The Beatles songs on iTunes, plus the fact that The Beatles got hosed by their record companies (like most bands), and that Stern needed The Beatles more than The Beatles need Stern ( I doubt that Ringo and Paul were just jumping at the chance to be on a pinball machine), I'm guessing Stern has had to pony up in the 25% range; If you have another percentage, bring it. Using 25% as constant, $6300.00 + $1575.00 (25%)= $7875.00. So, Stern does all of the work. Makes the design. Takes all the risk to produced this pin. The distros take all the risk to inventory and sell this pin. And The Beatles Store just sits back and collect royalty checks. For those of you who have called Stern greedy, what is your take on The Beatles Store? Is The Store singing "All you need is Love" like they are a bunch of hippies? Or is The Store singing "Money, that's what I want"? Stern could have told The Beatles to take a hike, and just done a remake of Seawitch. There would be no music but the pin would still play like The Beatles with all of the 21 Century upgrades. And nobody here would even be interested in a $6300.00 Seawitch. I just think people should think twice before they start shouting that Stern is trying to bend everybody over. The Platinum/Diamond are oddly/richly priced, but word on the street says Stern charged the distributors the same for all 3 models (as a holiday bone to throw them). I have no issue with the Gold street prices. No ramps, no novelty, nothing. It seems like a regurgitated SS layout for $9K. I guess I will be one less guy competing to buy one new or used. I literally have no desire to ever play it again. I'm not a huge Beatles fan but still find the game interesting/challenging. 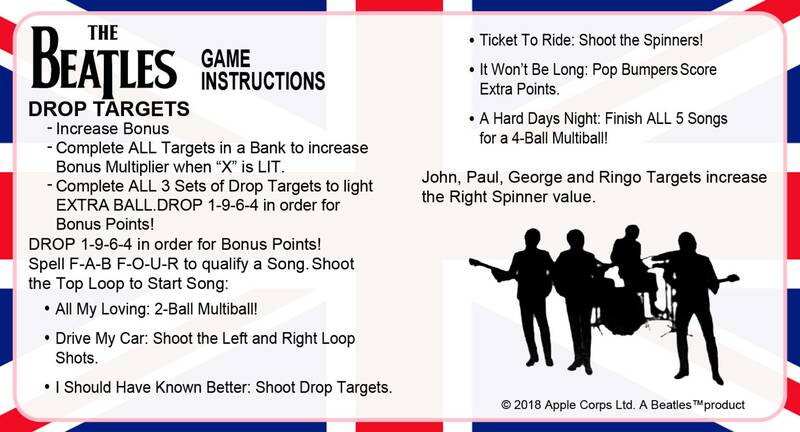 For those of us that grew up playing 80's "drop target" games, it may be easier to love? Who knows. I also think the art package is beautiful. I also like the speed and fairly short game times (useful when playing with 3 others). No game is for everyone..that's for sure. I completely agree with you. I also believe that your figures are very accurate. Dunno what you're looking for, but I whipped this one up quickly. If someone can send me a hi-res scan of the fab 4 outline on the lower right, I can do that a bit better. There's not much online of that. What can be done for the other card? 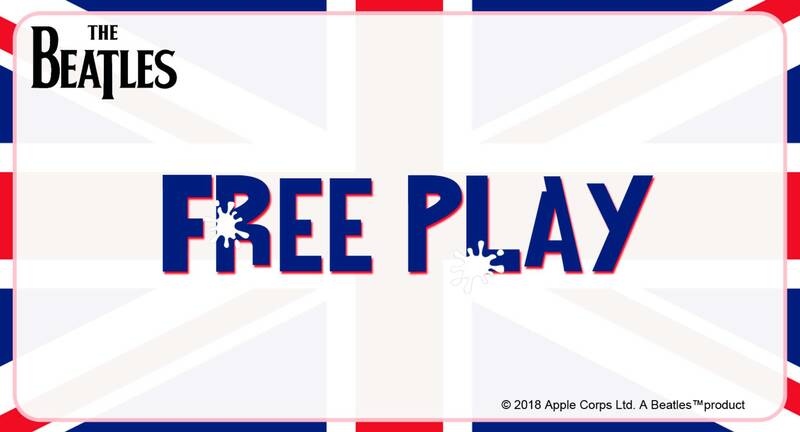 Maybe the British Flag that says Free Play? Why is the Beatles always lower than other new sterns? Is it a different kabinet size? Yes. It’s the same size as Early Sterns like Seawitch and Meteor. Quoted from SMI3:Why is the Beatles always lower than other new sterns? Is it a different kabinet size? No way. Beatles is a taller cab. Steeper slope up to the back for side blades. It is deeper, too. Compare the difference in space from the bottom of the coin door and the bottom of the cab. The front legs are mounted higher up the cab to drop the front. 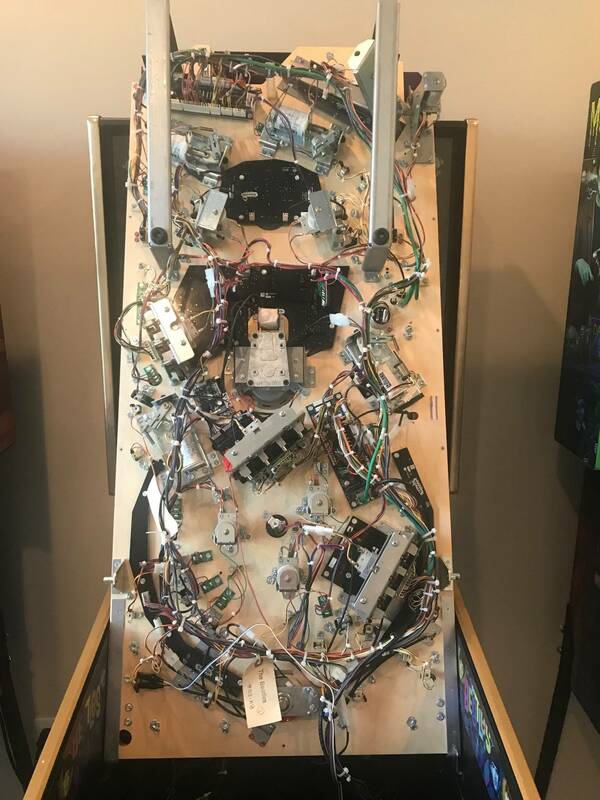 The top of The Beatles cabinet is lower in the back since there are no tall ramps or toys, similar to vintage pins, but not as low. 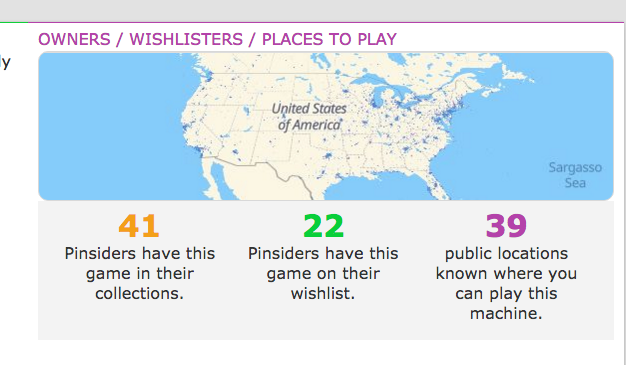 There are 3 new wish listers and one more was added to the Public Locations. 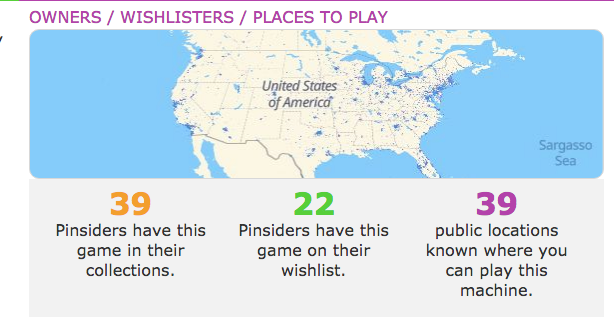 2 more pinsiders own a Beatles. 2 more locations have been added. Wishlisters have increased from 25 to 33. Beatles store has still sold zero since late November. Prices are being cut everywhere else, which doesn't say "huge hit". Even discounted, they're still about $1k too high, but if it gets into the low 6s, I can see them selling quite a few. Got any links showing the cut rate prices? No one is going to put that information online. Call around to distributors you have a relationship with. I played a Diamond at Silverball in Asbury Park over the weekend. It didn't do anything for me and I could not figure out why. It was just "eh" - I thought that a 20K toy would have been more cool. The sound was turned all the way down. Outlanes had what looked to be either planking or surface peeling that did not effect game. The extra $12k for a Diamond or $7k more for a platinum gets you a different powder coat color and a mirrored backglass (that may only be on the Diamond)...thats it. $400 topper is extra lol. Still want to get some time in on a gold edition. Went to Marvin's Marvelous Mechancial Museum a month or so back and it was down. The powder coat on it looked like the nicest powder coat I've ever seen on a Stern. I gave it another try yesterday a Pinball Pete's in East Lansing. They had a Munsters LE right next to it. Frankly, the Munsters made it look even WORSE. Beatles is more expensive and it didn't look nearly as good (Munsters playfield is A+) or play as good. Beatles is still "super meh" to me. I spent a good hour playing the Beatles, and quite frankly I still don't get it. I find this game to be awful, not much to do but to shoot randomly at stuff, the ball is slow, the rotating disc quite useless and the top right flipper kind of being in the middle just to let the player bother himself. Total miss for me, this one will go in my "Even for free, my floor space is more valuable" list. Just curious - and no offense intended - how much of the rules set do you know? Have you happened to watch any excellent players play the game in streams to see the strategies/techniques they employ? No offense taken. I don't know much of the rules set, and I have not watched any videos either. I usually look at what blinks or lights on the playfield, try a bunch of things that seem to make sense (like hit the drop target in order, find the shots, get in the different holes..), and play over and over until I get somewhere. 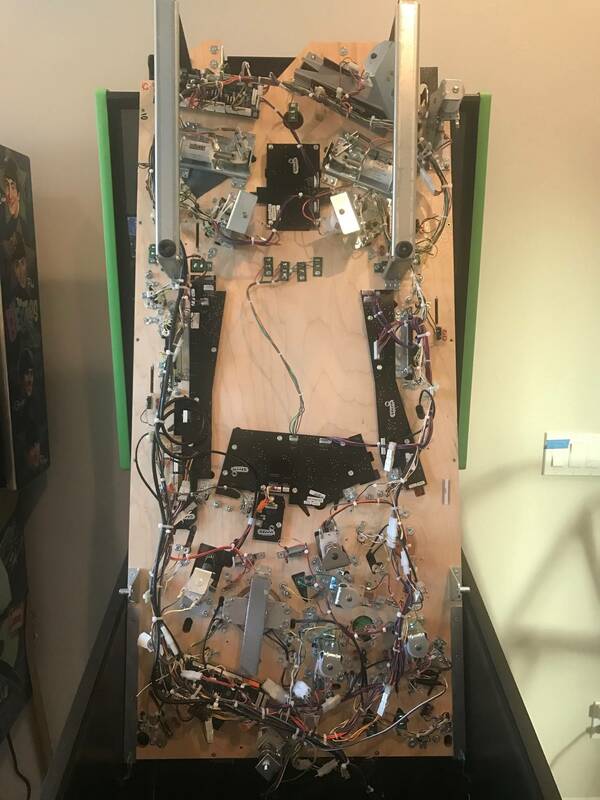 With that being said, I'm sure some people love it and I would likely not enter a debate on that, there is a pinball for everyone, and this one is not for me. Have played a bunch of games at the 2up recently. It is set up perfectly at that location. This machine, for me, is a pure joy to play and always leaves my heart racing and face smiling. This game is right up there with Tron for me on how it makes me feel when I play it. Pure euphoria. It takes the fun of EM machines but updates it for the ADD generation. That being said I do think it is too expensive and wish it had more songs. Sales are still happening. I finally got to play 3 different units at TPF. I like it but I don't love it. Since I already have a Seawitch I am not jonesing for one. Even with the more open loop I did not have much better luck hitting multiple loop shots than I do with my Seawitch. And that target that sits behind the lower left drop targets is not a give-me; That shot is tricky because it likes to exit down the left outlane. The music was nice. I did not think I would be impressed with the music but I was. If money and space were not an issue, I would like to have a Beatles. However, I also got to play Munsters at TPF and I hope in next 6-7 months that I can figure out a way to squeeze one of these into my tight spaces. I liked The Beatles. I liked Octoberfest. But Munsters really pushed all the right buttons. 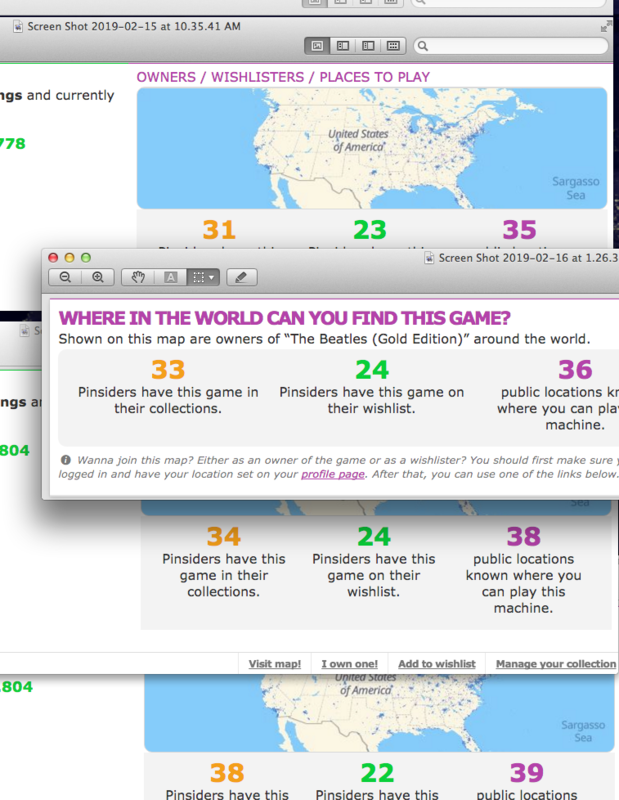 Beatles official website pinball sales since late November - still zero. They sold the first 10 pack, the diamonds and platinums and 2 golds out of the second 10 pack all in the first 3 weeks or so. Then sales flatlined. I've heard of deals on gold machines to get them moving. I'm assuming it's coming from Stern or Kapow to dealers since they have over 900 golds left to move if they make a second run to hit that 1964 they wanted to run, and those are not selling at $8k, and they're DEFINITELY not moving at $10k. Where are said deals, please! Since you will not or cannot reveal the source of your 900 units number that makes it suspect; it it like if you tell me you can walk on water then I want to see the picture. That said, I have made a recent observation that I choose not to reveal that leads me to think you are correct in that sales could be more robust. 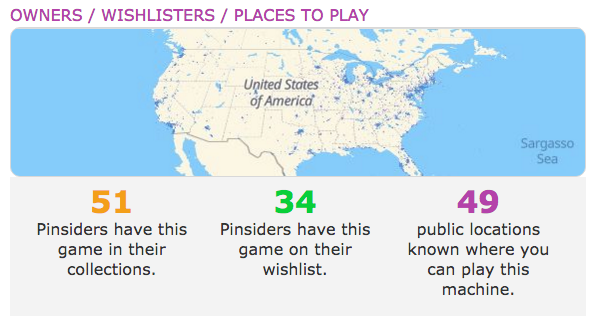 I also have been looking at Pinside’s ownership numbers for several pins, not just The Beatles. 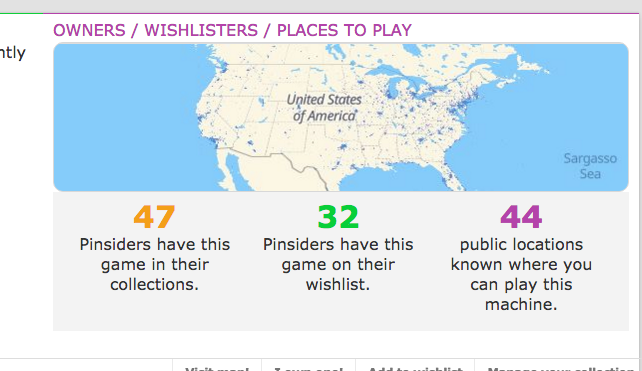 And when I saw that Ghostbusters Premium had 500 units produced but it is shown that 700 people own a Ghostbusters Premium and that there are 130 places to play a Ghostbusters Premium for a total of 830 Ghostbusters Premiums in the wild, or 330 more than the 500 produced, that throws all pinside ownership data in the trash can, as far as I am concerned. But here is a kicker. Stern said 1964 Beatles are to be produced. In reality, only Stern will know how many will be produced and shipped. So, if Stern does not the Beatles sales numbers it could decide to stop production and no one would know the difference. And even if people did know the difference, would they even care? A shortened production schedules would mean that all Beatles pin owners would own a pin that will be “more rare” and I don’t think any current owners could care if that situation were to arise. If demand has been met and Stern did stop production then everybody would win. Yes? No?